The Plot: Dr. Miles Bennell stumbles into a police station raving about not being insane, and needing people to listen to him. A psychiatrist arrives and agrees to hear Bennell's story. It goes like this: Miles returned from a medical conference to news that many of his patients had called and made appointments in a panic while he'd been gone, and then a day or so later, all called to cancel. When a friend says that she thinks her uncle isn't really her uncle, Miles is concerned for her. But then when a little boy comes in with his grandmother saying that his mother isn't really his mother, Miles begins to worry more generally. Stuff gets really weird when Miles gets called to his friend Jack Belicec's house because Jack's wife seems to have found a...body. It's a strange body. Sized and shaped like Jack, but without distinct facial features or fingerprints. Miles remembers his would-be girlfriend Becky saying she thought her dad was behaving strangely, and he darts to Becky's. In the dark basement, he believes he sees a doppelganger body of Becky in a locker down there, but afterward can't be sure. When he and Becky return to the Belicec place, though, the four of them discover giant alien pods in the greenhouse, each pod growing a copy of each of them. They've uncovered an alien plot to replace humans with unfeeling clones, and now they have to try to get away...and stay awake. 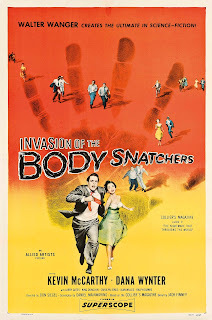 The Good, The Bad, The Indifferent: Invasion of the Body Snatchers is about as good as 1950s horror/sci-fi gets. There's not a lot of "guilty pleasure" here — this is lean, taut storytelling that is maybe not as visceral today as it would have been in 1956, but is no less thought-provoking. 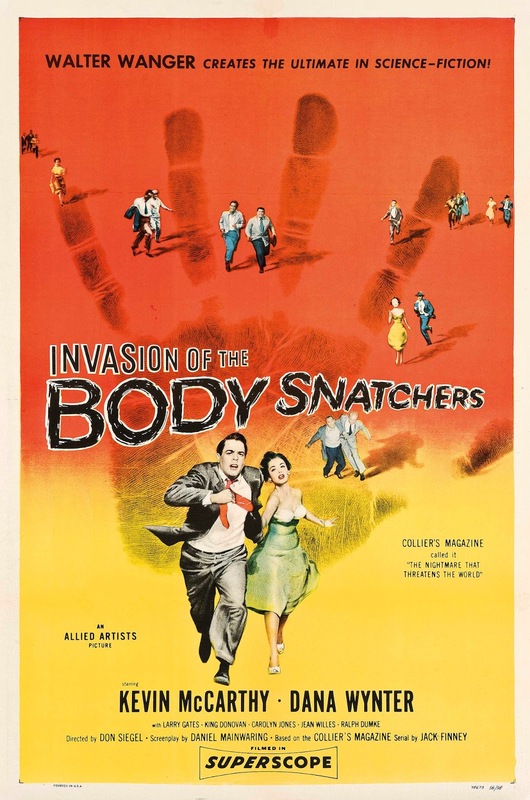 That this movie can be claimed as both a tacit endorsement of McCarthy-ite Red Scare paranoia and a rejection of that very same ideology speaks to how engaging it is. The filmmakers all went to their graves insisting that there was no political motivation or didactic intent behind the film, but there's no denying that it is a product of its zeitgeist. Can we be saved from the threat of secret Communist infiltration? Or, can we be saved from the reactionary forces in control that insist on homogeneity? This is in many ways the best of genre storytelling — a metaphorical treatment of existential forces that a society is wrestling with. Fun bit of connective tissue: Carolyn Jones (later Morticia Addams), was in last week's installment, House of Wax, and also plays Teddy Belicec in this movie. How It Stacks Up: I'm not sure which of these two version is "better," so suffice to say that when it comes to the daunting task of remaking classic movies, this is about as good as they come. 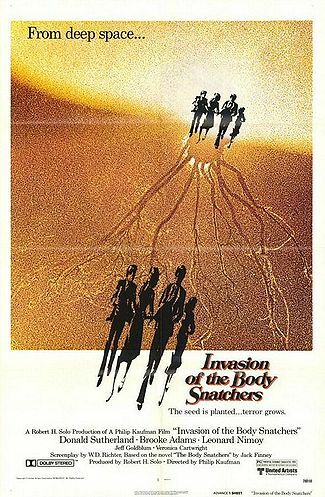 There are some elements that are a little dated — like the super-fake nosebleed on the pod-body of Jack Belicec (this time played by Jeff Goldblum) — but on the whole the practical effects hold up, and Philip Kaufman's film does a great job of painting on a broader canvas than the original film. Set in San Francisco, instead of a small town, the stakes begin much higher, and the barriers to stopping the alien pod-people from spreading are much more daunting. The ick-factor is ratcheted up in this version, and one additional characteristic added to the pod people in particular really heightens the creepiness. It's the shrieks. The shrieks of the pod people. It's unsettling and kind of chilling, and such a great reminder of how the well-chosen little things can be used to much better effect in horror than gore-for-gore's sake. Worth a Watch? Absolutely. I think it's hard to go wrong with either of these two versions. There are more versions out there, but these two I can recommend without reservation. Posted by Vance K — cult film reviewer and co-editor of nerds of a feather, flock together since 2012. Perennial watcher of dozens of horror movies each October. Not a pod person. As far as you know.